The Ghostly Grandeur Of A Desert Graveyard In El Paso Some 60,000 people have been buried in El Paso's Concordia Cemetery. The Texas graveyard is the final home to gunslingers, Mormon pioneers, Chinese immigrants, Mexican revolutionaries and Civil War veterans. 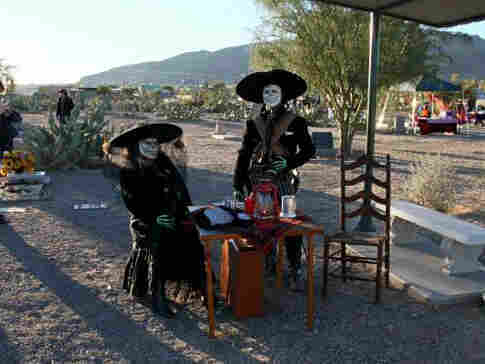 Its desert setting is a venue for a popular Day of the Dead festival and nightly ghost tours. A summer road trip to strange, funny, historic and notable gravesites and cemeteries across America. 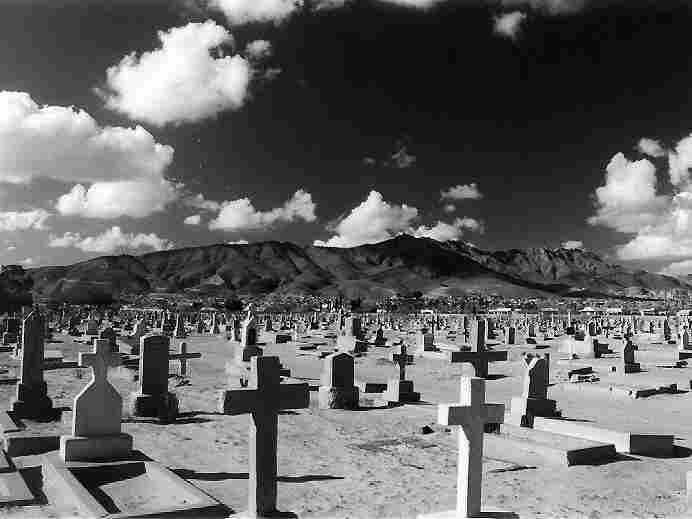 With more than 60,000 graves, Concordia Cemetery in El Paso, Texas, is an easy place in which to get lost. The graveyard covers some 52 acres. A couple celebrates Dia de los Muertos at the Concordia Cemetery. An infant grave for Cynthia Jimenez. The children's section of the cemetery is said to be haunted. 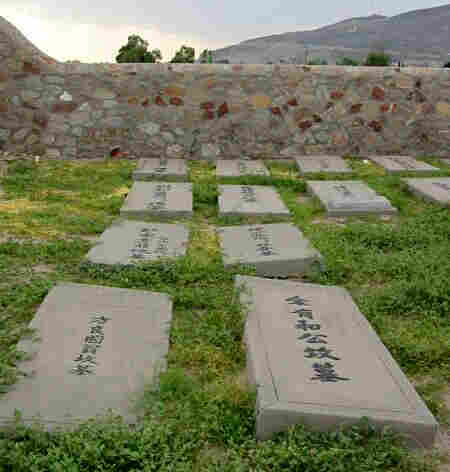 The cemetery holds the graves of men who came from China to build the intercontinental railroad in the 1800s. 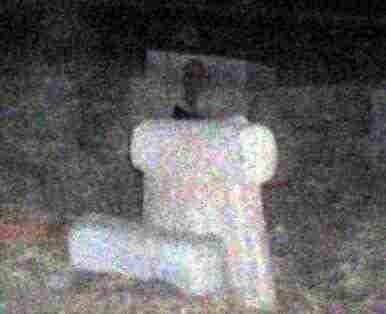 A photo provided by Henry Flores shows a headstone with what some believe is a ghost in the frame, perched behind the tomb. The grave of John Wesley Hardin draws many visitors and historians to Concordia. 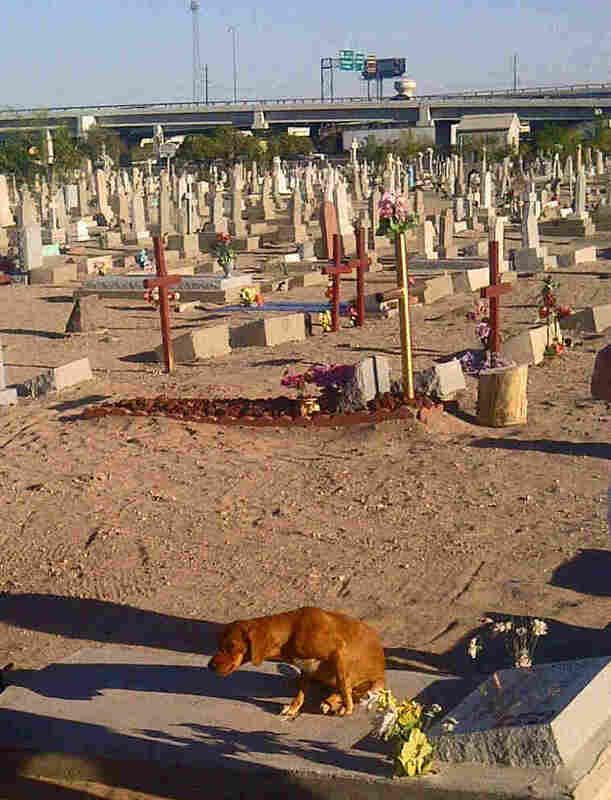 During a recent tour, the cemetery's visitors included a dog, who sought a cool place to rest. It's a raggedy moonscape; no lush green grass or tranquil arbors here. Concordia Cemetery in El Paso, Texas, just a few blocks from the Mexican border, is stark and dusty. It's overrun with crumbling concrete markers and old wooden crosses gone askew. And it goes on ... and on ... and on. "It's 52 acres," says Bernie Sargent, chair of the El Paso County Historical Commission. "Sixty thousand people buried here. And they're all dead." Most notorious among the dead is Wild West gunslinger John Wesley Hardin, interred here after he was shot at an El Paso saloon in 1895. "He died of lead poisoning," Sargent says, deadpan. Every year, Sargent and other El Paso history buffs re-enact Harding's killing. It doesn't take very long for him to slip into character. "I killed over 40 men, but they deserved it," he announces. And as for his own demise? "One shot in the back of the head and two more shots — one in the stomach and one in the arm. And I laid there dead for hours, while women dipped their dresses in my blood." Today's Hardin fans are more likely to leave trinkets as tributes at his grave. Patricia Kiddney, who runs the Concordia Heritage Association, points out a shot glass, coins and cartridge shells scattered over a plaque commemorating the man who was a "a friend to the poor," as Bob Dylan sang about him. From other points of view, the gunfighter might be remembered as a murderous jerk. There is much more to Concordia Cemetery than just Hardin, says Melissa Sargent. She's Bernie's wife, a Concordia board member and host of an El Paso history radio show. She notes it's a surprisingly cosmopolitan graveyard. "Because we are in the middle of nowhere," she acknowledges, for a city of about 650,000 people. "The very far west corner of Mexico, New Mexico and Texas." It surprises many to learn that Concordia Cemetery is home to a large Chinese population, many of whom were born in the 1800s. They're the men who built the intercontinental railroad. Their families are here, too. When the Chinese Exclusion Act made it difficult for more immigrants to come to this country in the 1870s, many Chinese and Japanese men ended up marrying Mexican women. So you'll see plenty of gravestones here with names like Manuel Cheng, who was born in the late 1800s. A popular restaurant in the area, run by descendants of another such family, has the name Paco Wong's. Concordia also has a Jewish section, a Mormon section, a Masonic section and a section for African-American veterans of the Civil War — the Buffalo Soldiers. El Paso has had an on-and-off military presence since the days of the Spanish conquistadors. Now it's home to Fort Bliss, one of the largest Army installations in the United States. "We've got that really wild mixture of people you wouldn't think, here in the middle of the desert," Melissa Sargent says proudly. The cemetery also has what seem to be vast, empty spaces. But they're not: Nobody is sure how many people were buried under cheap wood or sandstone markers that dissolved after years of dust storms and droughts. In a section set aside for children, one grave is marked with a spooky iron crib. But most of the markers are humble and look homemade. Henry Flores, of the Paso Del Norte Paranormal Society, claims the children's section is haunted. He leads ghost tours of the cemetery at night. "What some ladies experience is, if they have a C-section, they always tell us they feel something weird on their scar," he says. Completely true, affirms Flores' wife, Veronica. "It happened to me, and I've had two C-sections!" she says. The Floreses lead me to an area they call "the Vortex," said to exert a mysterious force. Since most of Concordia feels so spooky, it's easy to get deliciously creeped out by their stories about finding evidence of brujeria, or Mexican witchcraft, in the cemetery, and tales of hauntings and alleged ghost sightings captured on film. Like many El Pasoans, Henry Flores has numerous family members buried here, including his great-grandmother, who was Mexican and Cherokee. She's buried beneath a tangle of faded artificial roses. 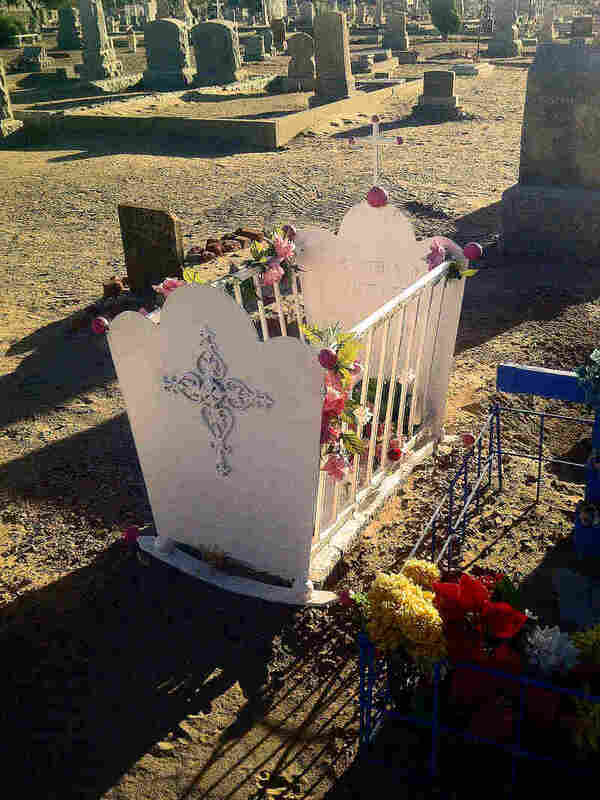 One of the best times to visit her, he says, is during Día de los Muertos, the Day of the Dead, a Mexican holiday observed by many El Pasoans.